A text is classified in a genre through the identification of key elements which occur in that text and in others of the same genre. 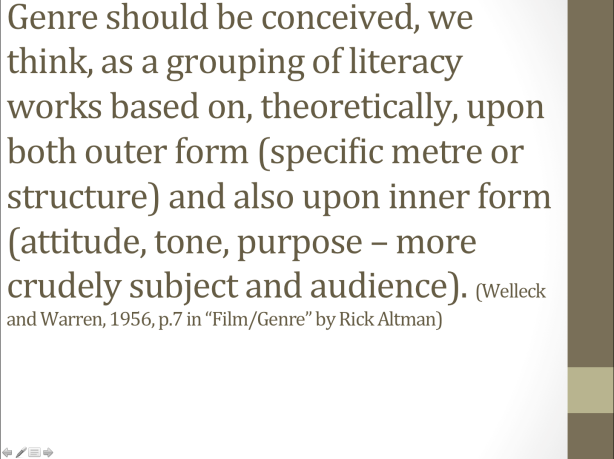 These elements may be referred to as paradigms, and range from costume to music to plot points to font (depending on the medium). Audiences recognise these paradigms, and bring a set of expectations to their reading of the text accordingly: the criminal will be brought to justice at the end of the police thriller. These paradigms may be grouped into those relating to iconography (ie the main signs and symbols that you see/hear),structure (the way a text is put together and the shape it takes) and theme (the issues and ideas it deals with).